These delicious 2 ingredient Pumpkin Brownie Bites are perfect for a snack, make a batch or two to bring into the office, or fill up a basket and set it out for brunch. 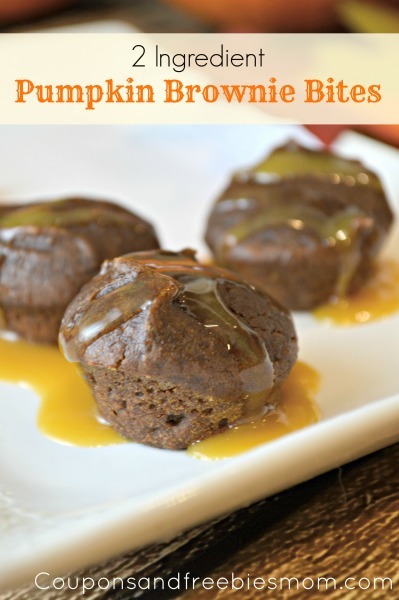 Easy and simply delicious, these brownie bites are moist and loaded up with yummy pumpkin and chocolate flavors! And the best part is that it doesn’t take more effort or ingredients to make them! They look just as pretty as they taste, so they make a wonderful presentation on a buffet or on the table. In a large bowl, combine the pumpkin and brownie mix until the 2 ingredients are well mixed (no dry mix left). Grease a mini muffin pan and scoop the brownie mix by the tablespoonful into each cup. Bake the brownies at 350 for about 20 minutes or until a toothpick inserted into the middle of one of the brownie bites comes out clean. Enjoy warm or cool or even drizzled in caramel! After they have cooled completely you can put some in a freezer safe zippered bag and place in the freezer for later, a little thaw and a quick heat in the microwave will have you a warm, sweet treat in no time. Enjoy these delicious 2 Ingredient Pumpkin Brownie Bites! I can’t get over how simple this is to make! I definitely have to make these soon. Wow! So easy! Thank you for sharing at Merry Monday! So excited to see a fresh take on the pumpkin recipe! This looks delicious! I do not think it could be any easier to make. OMG i cant believe how easy it is to make this!